Smart assistants have become a major part of mobile technology and have also quickly expanded into the home, but which is ideal for your hands-free needs: Google Assistant or Samsung's Bixby? 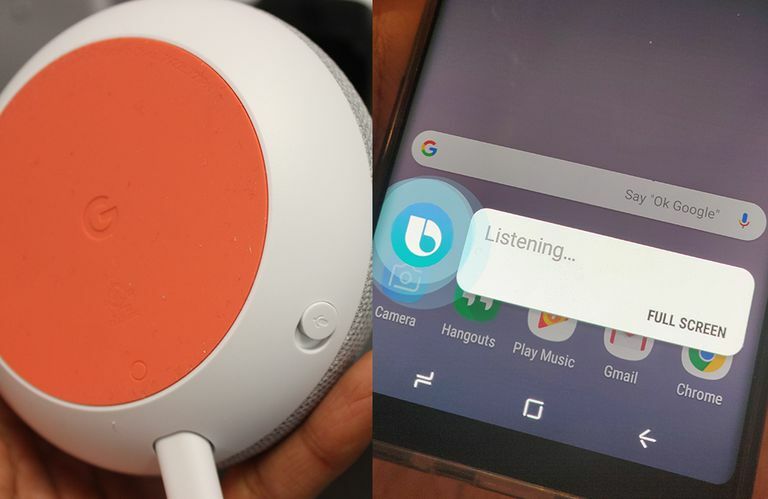 A lot of Google Assistant functions are centered around smart home products, including Google Home and Google Home Hub. There are also hundreds of smart home devices from various brands that support Google Assistant, like smart speakers, smart displays like the Lenovo Smart Display, as well as smart security cameras. Once set up with your account and internet connection, you can use any of these devices with voice commands. Users commonly set up smart home devices for consuming media, including music, movies, TV shows, podcasts, and audiobooks. Many products may require users to select a default service, from which it can pull content, but Google Assistant is compatible with most popular media services. While many smart home devices come with their own apps to control settings and individual functions, you can control all Google Assistant enabled devices from the Google Home app, making it easy to connect, disconnect, and troubleshoot devices in one location. You can take advantage of the Google Home app to control devices while away from home or too far away to make voice commands. You can also connect different services to the Google Home app to make your voice commands more granular. If you have Google Chromecast and Google Home, you can link your Netflix account to the Google Home app and use voice commands to start shows and movies without manually casting the Netflix app from your phone. While Google Assistant for phones has just as much power as it does for the home, users may have fewer reasons to go hands-free when they're out. Some common uses for Google Assistant on phones include voice dictation for creating and sending text messages and emails. Still, many users operate their smartphones with their hands as a primary function. That said, Google Assistant functions are available for users who require them, including those with accessibility needs; Google has touched a lot of bases when it comes to identifying the specific hands-free needs of its users. In addition to smartphones and home devices, Google Assistant is also enabled in Android Auto, which is becoming a standard for many vehicles. The smart car software is compatible with cars by Nissan, Honda, Aston Martin, and Lamborghini, among many others. A lot of Samsung Bixby functions are centered around smartphones. In fact, the Galaxy Note 8, Galaxy Note 9, Galaxy S8, and Galaxy S9 line of smartphones have a dedicated Bixby button, granting users easy access to the assistant. While Samsung is opening Bixby up to greater compatibility with third-party apps, many functions of the assistant are specific to Samsung devices and apps. The Galaxy Note 9 has the greatest outside compatibility, featuring the latest iteration of Bixby, and capabilities allowing users to open apps with the 'Hey Bixby' voice command. You can even use voice commands to control functions within certain apps, such as Google Maps, Uber, and Expedia. Review their schedule, current events, and updated content from certain apps with Bixby Home. Translate languages with Bixby Vision. Scan QR codes with Bixby Vision. Scan documents and turn them into PDFs. Use voice commands to control features within the camera app. Samsung is also expanding Bixby's functionality to its smart TVs and home appliances powered by its SmartThings hub, which enables users to control smart appliances in their homes through a single mobile app. Much like Bixby on smartphones, the SmartThings hub works best with Samsung products. Most of Samsung's 2018 smart TVs are Bixby enabled to allow users to voice control the SmartThings hub from their television screens. Samsung also plans to combine Bixby and its SmartThings hub with its smart fridges, with a goal of having all of its electronic devices Bixby enabled between 2019 and 2020. Samsung's ecosystem is still a work in progress. With less compatibility with third-party hardware and services, it could be challenging for users to build a complete smart home system based on Samsung products. The company has previewed its Galaxy Home smart speaker, which would give users a single device to control their other smart home devices, similar to how any Google Assistant smart speaker is often the main access point to controlling smart features around a home. Once released, the Galaxy Home will have Spotify as its primary music source, and users will have access to the service even if they don't have a Spotify account.